If one ranks Mediterranean countries in terms of their handling of seafood, Greece would not be one of the top three on the list. I have an especially hard time in the islands where it is hard to find unfrozen fish, and it is even harder to find a place to eat grilled fish that is not dried out. I was therefore quite stunned to find this rather simple-looking fish shack in the Kalithea district of Athens with a jolly, and a touch tacky, atmosphere. The absence of air conditioning, hardly compensated for by fans, coupled with the presence of the chain- smoking local clientele, made me feel like leaving at once. But I am glad that I did not, as I had one of the most- sumptuous and complete seafood meals in recent history, on a par with some seafood temples in Italy and Spain, for a fraction of the price. Chef Nicos is a gift from the economic crisis in the sense that when he was laid off from a five-star hotel as the Greek economy collapsed, he decided to run a shoestring operation to realize his dreams. That is, instead of working with pedestrian and frozen ingredients typical of luxury hotels, he wanted to cook with fresh ingredients that he buys daily from fishmongers. At the same time, Chef Nicos’ understanding of seafood (His cutting skills are evident in how he handles marinated raw fish) and his precision in cooking should make many three-star Michelin chefs look like apprentices. Our meal started with raw and wild oysters from Kalymnos Island and de-shelled fresh sea urchins in a one-shot vodka shooter glass. Kalymnos, known for its sponges, is a poor island with only a couple of good restaurants such as Harry’s Paradise, but is probably the best island for the variety of seafood and the skills of line, small-boat fishermen who are a dying species in today's world. Two years ago, I tasted the deeply-flavored reddish oysters on Kalymnos Island that reminded me of the very special red and wild oysters of Gallipoli in Apulia that you may find for a high price in that town's Restaurante Puritate. Following this nice surprise where I savored one of the great seafood products in the world, my wife and I were surprised by the hand-cutting and marinating skills of the chef in handling fish carpaccio. Nowadays one finds fish chopped in cubes (tartare) or cut thin everywhere by machine. It is still possible to find some amazing crudi in Italy such as at Osteria Vera, Paolo e Barbara, Aimo e Nadia, and Uliassi, but this is rare and very expensive. Nicos works with raw fish like a surgeon. He imparts just the right amount of seasoning and acidity (bergamot with sarago was especially noteworthy), and the quality of raw and pickled vegetables he pairs with raw fish, such as baby broccoli, cauliflower and carrots, are on par with any world class restaurant known for the quality of natural produce. We tasted consecutively his “melanouri”, his “sarago” and his swordfish and were impressed by the purity of flavors coupled with some nuances that added depth. 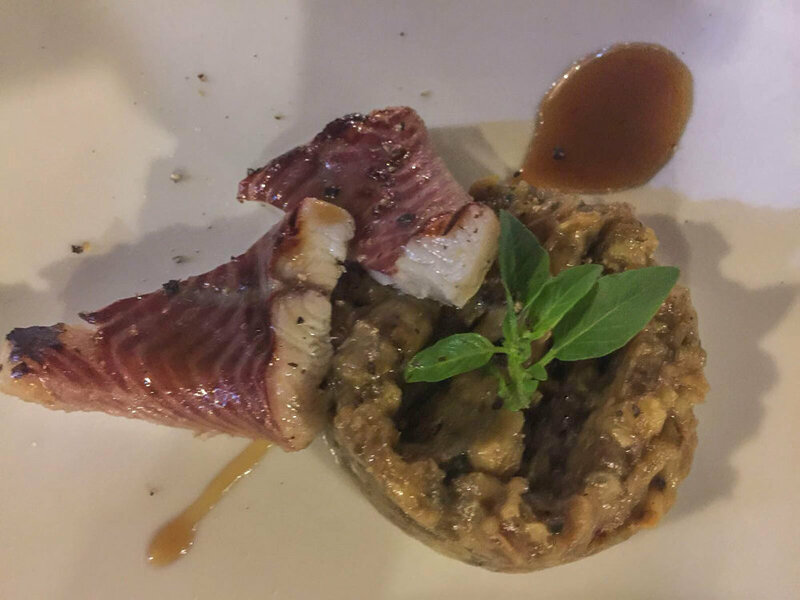 Two masterpieces followed: The first was fresh eel from Massolinghi with smoked eggplant purée and a sweet and sour sauce with honey, balsamic vinegar, and fish stock. The sweetness was the right amount, a far cry from the overly-sweet sake- based sauces you find in Western Japanese restaurants or the candied foie gras and eel combination. The quality of the eggplant was also a rare find in the contemporary world. Next we were served barely-cooked liver from two different fishes and squid. Many diners have eaten “ankimo”, or monkfish liver, but I have only eaten it at this level in Japan. Calamari eggs are always great; I found them a few times in Turkey, but the chefs used too much butter and overcook them. They were perfectly handled here. Finally, we had wild daurade eggs. Together the three fish livers amounted to a rare experience in varying tastes and textures. All three of them were fluffy, light, and soulful. I cannot help but think that the divide between “comfort food” and avant-garde is sometimes artificial. Here the two are rolled into one, and I have never had such an experience, except at Elkano in Spain. The next dish, small scallops from Lesbos served in the shell with the roe attached to showcase the quality, was the only flawed dish. It was a touch overcooked which masked the sweetness of this delicate shellfish. But the “orfoz” (merou) fish was excellent. It was cooked slowly in the oven as Italians do, with white wine, olive oil, lemon, and little tomatoes. This was a very-tasty deep sea rock fish, not easy to cook so precisely. We did not want desserts, but they offered us two. The very fresh lemon pie and the raisin-pumpkin pie were excellent. I should also note that homemade whole wheat and black flour breads belong to a category that is becoming gradually extinct. The house sauvignon from Crete is “passable”, but for cooking at this level you need the right wine to pair with the bright and acidulated flavors without butter. I would not recommend a white Burgundy, but perhaps an Aligoté or Carricante from volcanic Etna, or an Assyrtiko from Santorini. We had none of these choices since I brought with me from a shop in Athens a wine that was new to me, a 2015 Gentilini wild fermentation, Robola from Cephalonia. I had tried this winemaker's normal Robola, but this was much better. The bright, pure flavors of the wine, with delicious citrus notes and noticeable saline minerality, married very well with the cuisine. Our young server was extremely friendly and efficient, despite the fact that he was virtually alone in serving at least 50 customers. He spoke English. Owner-chef Nicos does not, but communicates well with his genuinely-friendly gestures. His eyes reveal his the sensitivity, warmth, and modesty that is reflected in his cooking.